A son stands on the east side of the Jordan River and asks his father what the stack of stones means. The people had to cross over to the other side of the River. It was the flood season and the waters were high. Yet God told the people to move forward into the water. And God delivered them through to the other side. Now the people have the stones that were taken out of the middle of the river as a memorial for that time of help. 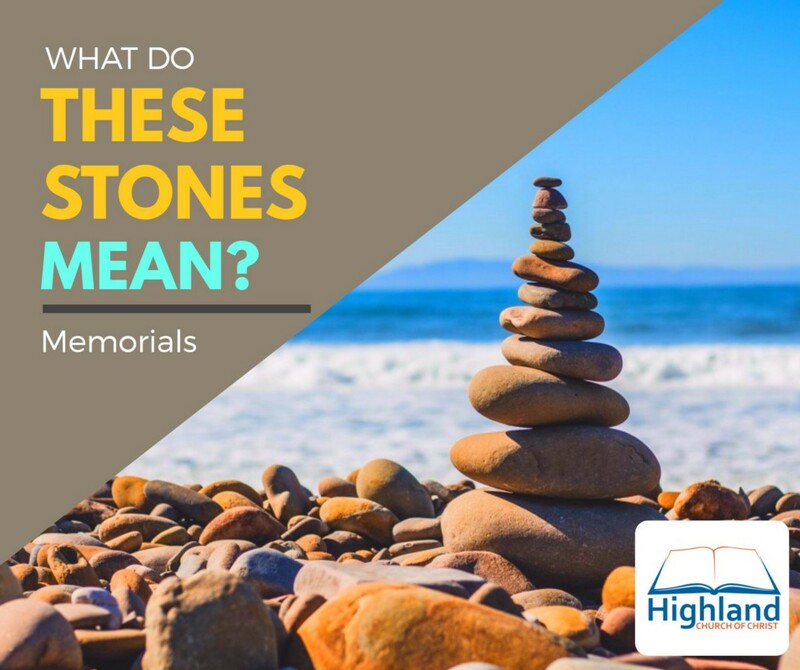 Today, your child may ask, “what does baptism mean?” or “what does the Lord’s Supper mean?” We have these memorials that serve several purposes. Memorials Tell of God’s Past Authority. They serve as a reminder for us into the future. Joshua 4:21–23 tells of the story of the memorial stones when God dried up the Jordan River so the people could cross. God saw the importance of the memorial so they could look back and remember what God had done for them. The things that were written for us were written so we can learn (Romans 15:4). A reminder of the history of the Israelites is a reminder of our history. Baptism (Romans 6:3–4) Reminds us of the power of God over sin. The Lord’s Supper (1 Corr 1:26). The Lord’s Supper gives us the opportunity to remember Gods’s power over sin weekly. It reminds us that Spirit became man and that He allowed Himself to be treated brutally and crucified to bear our sins. And we are reminded of the Power that raised Him from the dead on the third day when we partake of the bread and the cup. It’s not merely a nation that God gave us victory over, but our victory is over sin and death. If you are a Christian, you have been blessed by the power of God because you repented and came back to God. Baptism saves those who are lost (Mark 16:16) and the Lord’s Supper helps us to be grateful every week for the grace God gives us that we have the opportunity to be saved (1 Cor 11:27–30). Let us faithfully continue to observe the memorials that God has asked of us so that they can serve their purposes in our memories.